Let’s talk about escalators. Let’s really talk about them. Firstly, who in their right mind thought that a moving staircase was a good idea? As if I don’t have enough problems going up and down regular, non-mobile stairs, yea, why not, let’s make the stairs move. Minus 30 points from Gryffindor! Humans with ASD (Autistic Spectrum Disorders), Sensory Disorders, inner ear issues, can I get an amen?! As I prepare myself to get onto the death trap escalator, humans gather behind me and I can feel their sense of impatience growing indefinitely. 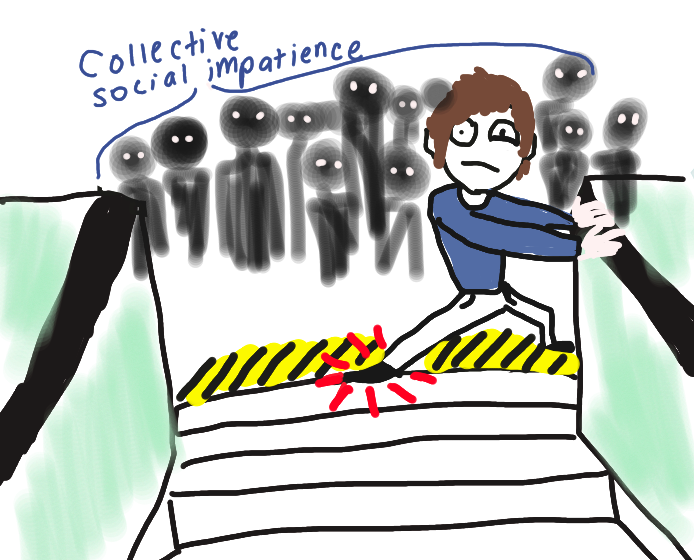 Except it’s worse because it’s a collective social impatience; like a giant ugly blob of peer pressure. Escalators are terrible aside from the possible threat of being sucked into the machinery, underneath the floor and down into the deepest pit of hell. Momsy always warned me of that when I was younger. Thanks mom. 1. Prepare body, mind, and spirit for descent/elevation via moving stairs. This is a personal experience unique to each individual. 2. 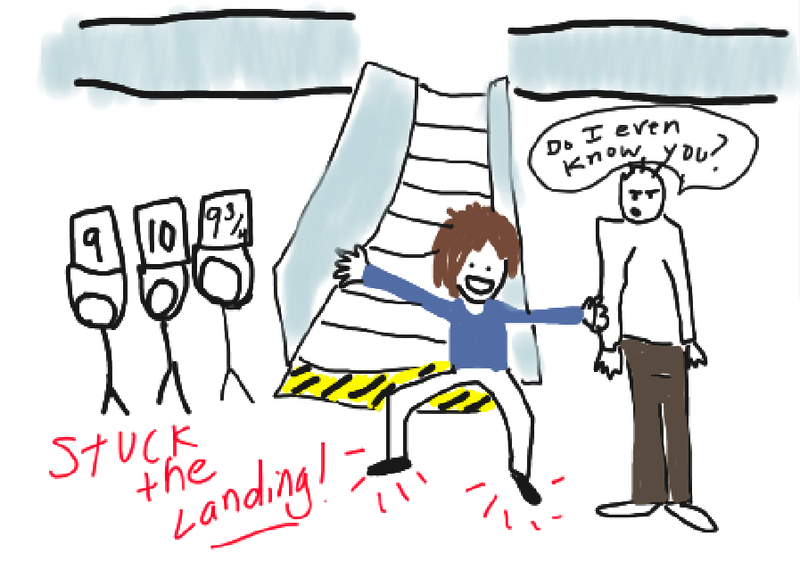 Allow other humans to go ahead of you, knowing your escalator experience will take longer. This will avoid collective social impatience to build up behind you. 3. When the time has come, select a stair as it emerges from the start of the staircase. But choose quickly, or else you will miss it, and then have to pretend you weren’t going for that stair in the first place. 4. Now comes the hard part, in a matter of mere seconds, you must hurl your body through the air and securely onto the chosen step before it begins its journey. 5. Once on the step, grab hold of the handrail, which may or may not be covered in germs. If so, casually grab the nearest person who will (hopefully) be less germy. Hold onto them for as long as socially possible. Don’t make eye contact. 6. Don’t look down, up, sideways, left, or right. Closing your eyes only will help sometimes. Just don’t look anywhere…pretend your on a tropical island sipping a martini. 7. Once you find yourself towards solid ground again, prepare yourself for dismount. Let go of the handrail or stranger, and bend your knees slightly. Focus on your landing spot. It’s all you now. 8. Quickly jump off, and land on both feet. Use your arms (or a stranger again if necessary) to stable yourself. Be as nonchalant as possible. The more I think about this escalator stuff, it’s absolutely absurd. 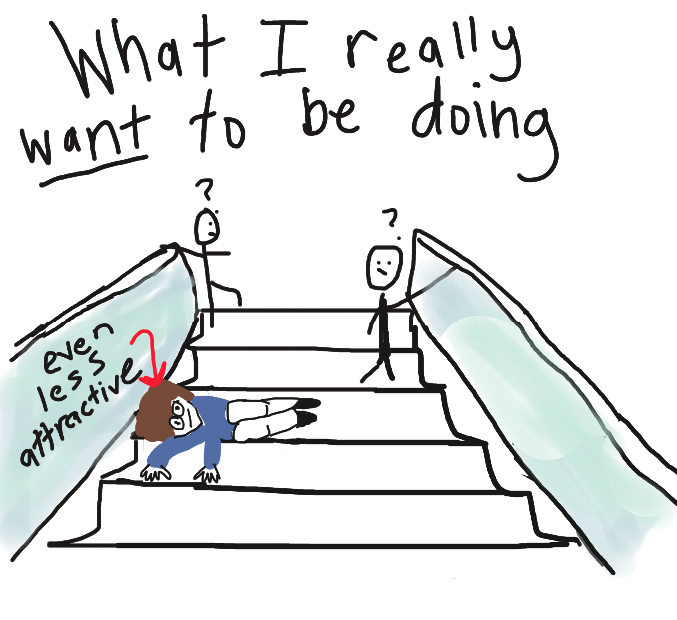 My whole life, whenever I encountered an escalator, I’ve always had to find a REAL staircase or an elevator to use instead because the escalator was so irrational. 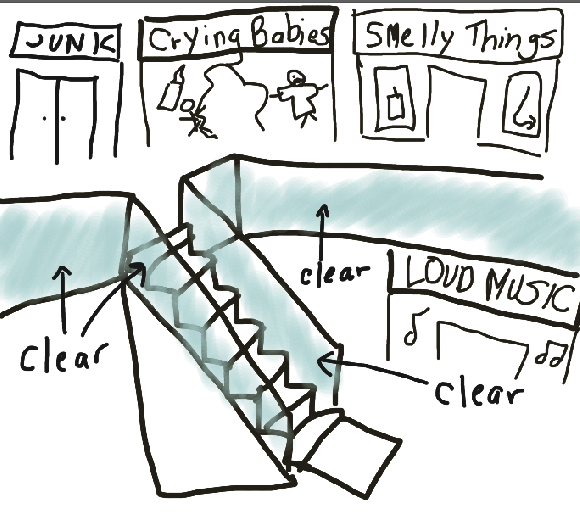 Side note: the elevator being used for an escalator alternative has to have solid walls, and not see-through walls, because I can’t handle that see-through crap sauce as I’ve already explained. I am the member of the family that refuses to go down the escalator at the mall. I am the one that causes the hassle for everyone. 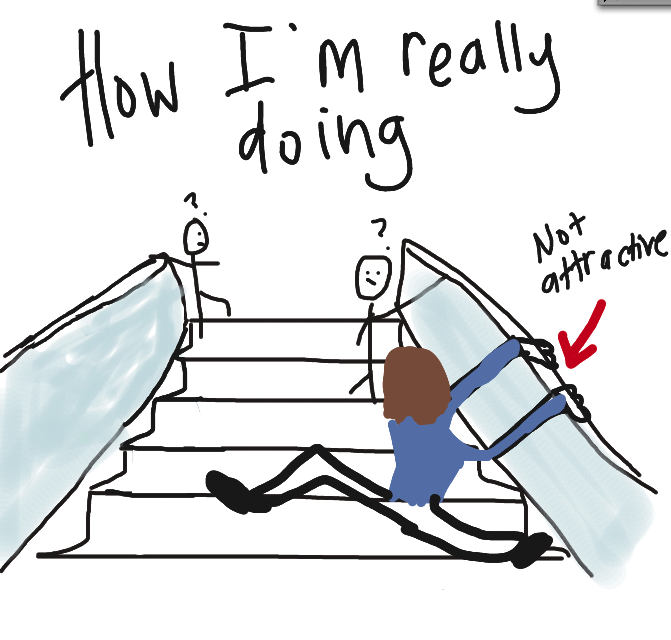 My family knows this and I’m glad they enjoy themselves as they watch me attempt to tackle an escalator. Also, don’t ask me why I even go to malls because I don’t know, alright? To this day, I believe the escalator is a traumatic torture device used to publicly humiliate me and others like me who experience a neurological disconnect from the modern world. Humans are not designed evolutionarily to travel via moving staircase. It’s just WRONG. 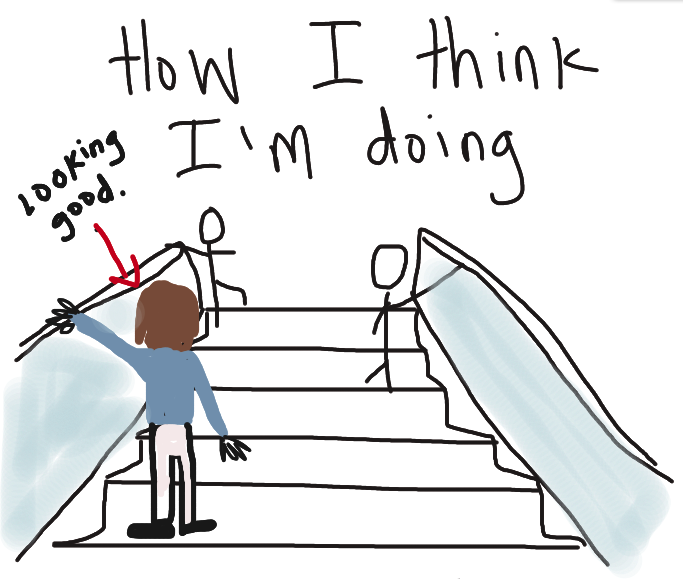 In the end, the escalator and I have slightly improved our relationship over time. Do I still sweat like a sinner in church when I approach an escalator. You bet. Do I get on it and off it and do the best I can despite the ridiculousness of the situation. Yes. You can see the collective social impatience building up behind him. Everything I said was true.